Reigning GP2 champion Romain Gorsjean has commented after his early exit of the Australian Grand Prix, saying he feels Maldonado braked far to late. The Franco-Swiss driver stunned everyone when in Q3 yesterday on his final run, the newbie placed his Lotus Renault car 3rd on the grid. The impressive Grosjean was obviously ecstatic by the huge grin on his face throughout the top 3 drivers press conference. This brilliant performance was quickly destroyed after Romain struggled to get off the line and dropped down into sixth before the first corner. Lotus Renault Technical Director Eric Boullier confirmed Gorsjean had an issue with 2nd gear getting off the line. This can be seen on the on-board footage, it shows the Lotus Renault driver hitting the limiter in specified gear. 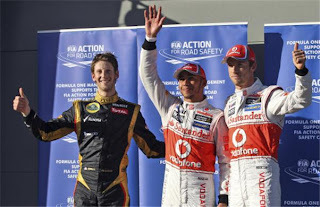 Problems then got a lot worse for the now 6th placed Romain. Grosjean was entering turn 13 when Williams driver Pastor Maldonado stuck a maneuver down the inside and made the GP2 champion yield. Although the Lotus Renault driver obliged Pastor was very aggressive and continued forcing off Grosjean was ended up with them colliding. The damage was to severe for Romain as the steering had been damaged and he retired immediately - The well qualified Frenchman didn't even complete a single lap. What are your views on the accident? Let me know in a comment or Tweet me via the link below.